The chart shows the main sources of site traffic, from highest to lowest. Of course the order can vary from site to site, but as a general rule search engines will provide the most traffic, next affiliates, then email, advertising, directories, link partners and finally press and magazine articles. You can see the corresponding e-marketing techniques and which traffic sources they effect. As you can see that some of the lesser traffic sources such as Directories and Link partners place a vital role toward search engine traffic. Your internet marketing strategy is firstly building a working marketing engine made up from components of SEO, affiliate, email, directories, ppc, links and press releases. Then keeping this engine oiled, fueled up, and running in the right direction. 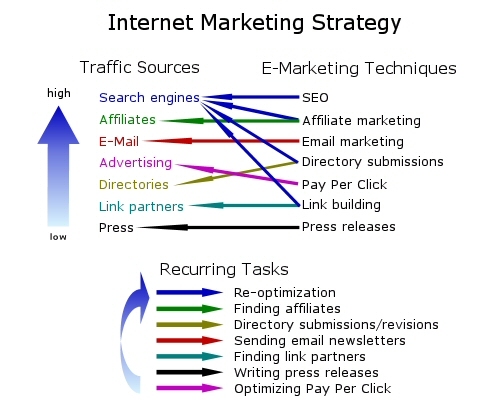 There are recurring tasks that must be done periodically to keep the internet marketing engine running. From time to time you may need to remove and completely rebuild components because your situation or the markets, have changed. If your site is already launched and running, how much does the chart above match what you have setup and what you are already doing? You should be able to quickly see what you've been missing out, or doing wrong. Follow the sections of this site to be given step by step guides to building up all the components of your internet marketing strategy, and put your site on the road to success.